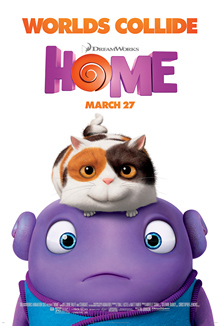 Home is a 2015 American 3D computer-animated science-fiction buddy comedy film produced by DreamWorks Animation and distributed by 20th Century Fox. It is loosely based on Adam Rex’s 2007 children’s book The True Meaning of Smekday and starring the voices of Jim Parsons, Rihanna, Steve Martin, Jennifer Lopez, and Matt Jones. Tim Johnson is the director of the film, Chris Jenkins and Suzanne Buirgy are its producers, and the screenplay is by Tom J. Astle and Matt Ember. The story takes place on planet Earth, where an alien race called the Boov invade the planet. However, a girl named Gratuity “Tip” Tucci manages to avoid capture, and goes on the run with Oh, a fugitive Boov. It is rather silly, in a fun Science Fiction way and Jim Parsons is good as the main character Boov. Despite is low score on Rotten Tomatoes (47%) it was popular, making a Box Office of $386 million on a $135 million dollar film.